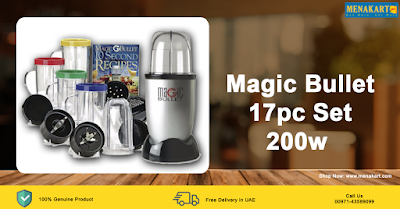 If you are looking for an electric mixer that will make your time in the kitchen less strenuous, then have a look at the beautiful Magic Bullet Express Blender and Mixer ASTV1712. Available in a beautiful set of 17 pieces, it is capable of handling all your mixing tasks with ease and expertise. Use this sleek silver Magic Bullet blender and its accessories for chopping, mixing, blending, mincing, and other cooking process. It can smoothen the toughest of ingredients in a couple of spins with a powerful performance that is brought to you by a robust motor with a 200W power output. This stylish blender takes up the same amount of space as a large coffee mug!